Walk into any quality Montessori school in the world, and you will see some of the most beautifully prepared learning environments imaginable. Wooden materials, carefully arranged shelves, observant teachers. What you won't find, by and large, is a tech-heavy curriculum. 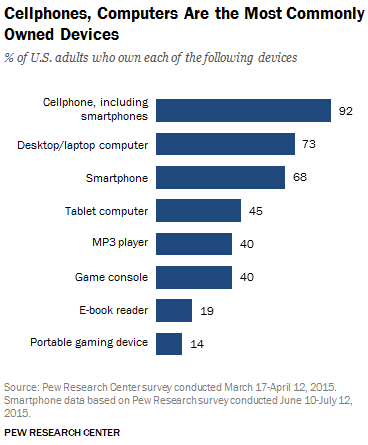 Though nearly every adult American owns a cellphone (see Pew Research chart), rare is the Montessori school where smartphones, tablets, or computers play a major role. The lack of computer-based assignments might surprise public school teachers given how gung-ho traditional schools are about technology. Montessorians, by comparison, have a somewhat less enthusiastic opinion with technology - especially in the early years. In Montessori schools, the amount of technology integration depends on the educational philosophy of the teachers. Some schools ban all technology, believing that children need to learn with their own eyes and hands and absolutely not while watching a screen. Some schools have a computer in the classroom but only allow it for teachers. Some classrooms have computers in the classroom and allow students to use them for internet research and to practice typing skills. Occasionally you will find a Montessori classroom that embraces more than that in the elementary years, but at least in the Montessori 0-6 year old scene, you will find a near-absence of the digital. If you are a parent at home exploring apps on your tablet or smartphone, you may see apps for something like "Montessori Math" or "The Pink Tower" (a quintessential Montessori material). Don't fool yourself into thinking that if you download this app for your child, he is doing the activity that Montessori developed and adopted into her method. There's a reason for all those beautiful wooden materials. Maria Montessori was not aware of the enormous technological changes that would occur in the years after her death (1952), but she was adamant that the learning of abstract ideas begin with the child's own hands using concrete objects. I suspect that Dr. Montessori would approve of some careful and limited use of technology were she alive today. How could she not be amazed by the global social connections? Today, a grandparent might video chat with a faraway grandchild. A parent-to-be might search for tips on preparing the home for a new baby. A student might research the Galapagos Islands not only by reading books but also by watching a video of a family on vacation describing what they see and feel. There are lots of interesting opportunities for us to use technology in a way that enhances our exploration of and connection to the world that most of us see as positive additions to a learning environment. The problem arises when we attempt to replace a valuable hands-on experience with an abstract one too early. Take the pink tower, for example. To an inexperienced eye, the child simply stacks a set of ten cubes of varying sizes into a tower, with the largest on the bottom and the tiniest on the top. An app on a tablet could presumably replace this activity with a virtual representation of pink squares that can be dragged and dropped into position. A child of preschool age can certainly learn to order these squares by size, but so much is lost in value! When the child carefully lifts each cube, its size is known by a myriad of sensory cues that go far beyond the visual. The shape and size of each smooth side is fully explored by little hands; the weight of each is compared to the next. A misplacement of the next-smallest cube is easily recognizable when the heavier cube on top causes the tower to wobble or fall. Even the tower itself is subconsciously compared to the child's own body size and the mathematics of cubing in increments of 1 cm each is internalized in order to develop future algebraic thinking. Swiping the pink blocks on an app is about as realistic as a flight simulator is to flying an actual airplane. So How Do We Know What's Appropriate? No doubt, we have a ton of intriguing technological inventions at our disposal for use with kids, and as parents and teachers, it is up to us to decide how they may or may not fit in with our philosophy of education. We must be especially careful when simply regurgitating tried and true teaching techniques and manipulatives in a virtual format. What looks like the same activity may not actually nurture the child's full engagement of the senses, which is a non-negotiable in any quality material designed for early childhood. Our children deserve for us to constantly question the educational validity of any of the techy stuff in their environment. There is only one path to collective knowledge of what is helpful or a hinder to a child's development, and that is through continued observation of the children themselves.